One of the newest members to the ORCA scene, the Georgia Retail Association’s Organized Retail Crime Alliance (GRAORCA) was founded in early 2012. However, despite its recent creation, the group itself has actually been around for much longer. In July 2009, the Georgia Retail Association held an open meeting in the Georgia State Capitol building to discuss the rash of afterhours smash and grab burglaries that were plaguing the Atlanta market. From that meeting, a group of retailers, Atlanta area law enforcement officials, and the Fulton County Community Prosecutor, under the auspices of GRA, formed a coalition whose primary objective was to draft and pass legislation that would stiffen penalties for involvement in Smash and Grab burglaries with emphasis on those recruiting juveniles to commit such acts. 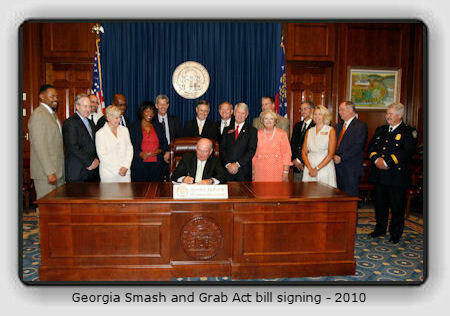 Eight months later, with minutes left in the 2010 legislative session, the Georgia Smash and Grab Act was passed. Once the bill had passed, the coalition evolved into the Georgia Retail Association’s Loss Prevention Council (GRALPC). “We quickly recognized the power in numbers and the positive impact that the coalition had on the community, so forming the Council was the obvious next step,” said Mike Liberatore, who has chaired the GRALPC since its inception. The Council’s membership currently includes LP representatives from Macy’s, Verizon Wireless, GameStop, T-Mobile, Wal-Mart, Home Depot, Saks Fifth Avenue, Target, as well as The Fulton County District Attorney’s office and the Atlanta Police Department. The group has made tremendous strides over the last few years, hosting two annual retail crime conferences with more than 300 in attendance for each. Additionally, on September 13th, the Council trained over 150 police officers and investigators at their Law Enforcement Only Conference hosted by The Home Depot at their corporate headquarters in Atlanta. The Council has been very involved in community outreach, donating proceeds from their first conference in 2011 to the Atlanta Community Teen Coalition, a non-profit organization committed to directing inner city youth away from gang life and aiming them towards academic success and entrepreneurialism. At the Council’s second annual conference which was held at America’s Mart in Downtown Atlanta, the Council announced that a $3000 donation would be made to the Atlanta Police Athletic League. “When it was all said and done, PAL received a $5000 check from GRA,” said Liberatore.